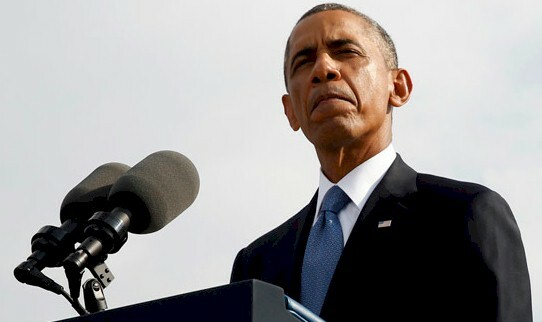 President Obama seems poised to declare war on the world. American policy in 2014 has taken on a “zombie-like” feverishness aimed at war. Terror has been turned into a horror gag reel these days, as Washington acts out some fetish for chaos in our world. And for those who consider Obama a Machiavellian genius, this requires a massive intellect.A modern day political Frankenstein seems more apt. President Obama seems poised to declare war on the world. American policy in 2014 has taken on a “zombie-like” feverishness aimed at war. Terror has been turned into a horror gag reel these days, as Washington acts out some fetish for chaos in our world. And for those who consider Obama a Machiavellian genius, this requires a massive intellect. A modern day political Frankenstein seems more apt. America has armed and sponsored Israel so they can butcher Palestinian civilians. We’re prodding NATO moves in Ukraine, right on Russia’s doorstep. We’ve fueled a fetish to unseat Syria’s Assad, and to perpetuate the Iraq war, maybe forever. Yes, Washington’s gone totally biblical, and not in a good way. Meanwhile, we sit on our couches in Omaha or Orlando, reading the morning news served up to strike fear and loathing. A thousand authors, conjure for you, images of Russian bears devouring Europe, of gleaming scimitars slicing the air, and a rerun of those twin towers plummeting, down, down, down. But this is a time of WikiLeaks, the NSA spies, lies, deceit, and misdirect. You must see it, anyone surely must! While Caliphates, the Supreme Soviet, and Hamas rockets are blamed for baby killing, a crumbling western civilization is not brought about by Vladimir Putin, but by a decaying system of greed, graft, and mediocre leaders. The fact is ISIS, the Arab Spring, and Ukraine and yes, Gaza are all components of Washington policy under Obama. This cannot be repudiated, but it can be reasoned. In a book entitled Arabesque Americaine, Dr. Ahmed Bensaada assembles a body of evidence that the so-called Arab Spring was a destabilization operation, funded and orchestrated by the CIA, the US State Department and historically CIA-funded foundations for so-called freedom. No, you c1985annot use the “he’s one of them” excuse, for the trail of complicity breadcrumbs Bensaada reveals, they lead to; the National Endowment for Democracy (NED), National Democratic Institute for International Affairs (NDI), the International Republic Institute (IRI), Freedom House (FH), the Albert Einstein Institution (see reference below), the Center for Non Violent Action and Strategies (CANVAS), the United States Agency for International Development (USAID) — and George Soros’ Open Society Institute (OSI), and key actors in our American foreign policy farce. Make no mistake though; we should not be deluded into believing that Barack Obama is some mad genius revolutionary. The hierarchy and system behind him might be the anti-Christ. As proof the “system” of thought in the west it corrupted, let’s look at Ukraine revolutionary John McCain, for a moment. McCain, who we all know sits at the table of massive military industrialists in Arizona is also the Kiev regime’s Senatorial superhero. While some of us would like to classify his brand of Neo-conservatism as the rambling madness of a washed up presidential wannabe, the mechanisms beneath the Senator bear witness to systematic abuses. Case in point, McCain is head of an organization known as the International Republican Institute (IRI). That institution’s stated goal is to; “advance democracy worldwide” – but the “how,” the spread, and the definition of democracy, these need scrutiny by us. The good people of IRI function as researchers, pollsters, and analysts many times, fully integrated with the US State Department. But still further inside American geo-strategizing, the aforementioned Albert Einstein Institution, we can define the utter decay of thinking. This report entitled, “On Strategic Non-Violent Change,” by one of the world’s leading insurrection experts, Colonel Robert Helvey, shows clearly the blurred lines in between the state, the military, and even the corporations. Helvey’s ideas on transforming the youth of nations into insurrectionists are well known. But his recent coming out over Ukraine’s recent “coup d’état,” this is lesser known. Like it or not, we are led by people who act on this sort of belief. Today, NATO exercises are held in Ukraine, the ceasefire Vladimir Putin was instrumental in attaining is already sabotaged by untimely anti-Russia sanctions, and unmistakable aggression from the west. Daniel McAdams of the Ron Paul Institute for Peace and Prosperity calls the West’s subversion of the Ukraine peace process by NATO a “grand deception.” But beyond just a very few dissenting voices, Western journalism is devoid of editorials for peace. There simply is no “anti-war” sentiment, not in the press. To sum up here, you don’t have to have a PhD in political science to understand Machiavellian intentions. The Italian philosopher outlined how the city states of a former empire could be congealed on a common course again, via the machinations of a “prince” or dictator. Power, as such, was outlined as ideology to convert and control the masses, vulgar or otherwise. The appearance of good, where controlling skullduggery and fear mongering exists, the systematic physical and psychological makeup of society, all these control mechanisms are leveraged on us today. Directed at Barack Obama, for instance, the appearance of good was cemented in his Nobel Peace Prize. The continual stream of Obama with little American kids, this exudes Machiavelli’s principles, as do Obama’s grand schemes for health care, climate change, and the cruelty of drone warfare. In a nutshell, Obama’s advisers are political scientists of the first order. Phil Butler is a prolific technology, the travel industry, and news journalist and editor. He's also a partner at one of Europe’s leading PR and digital marketing firms, Pamil Visions PR. Phil contributes to the Huffington Post, The Epoch Times in print and online, and is a regular public relations analyst for Russia Today, as well as other international media.